The North Country is an intelligent, tough, resourceful sheep that produces both a superior lamb crop and a fleece that delights handspinners. It has outstanding crossbreeding ability and can be used as either the sire or the dam breed. The resulting lambs from crossbreeding to meat breeds have superior carcasses. It is a big, long, rugged hill sheep, not bred for the show ring, but for production, under adverse conditions. Lambs are born alert and active and the ewes have a very strong mothering instinct and are exceptionally good milkers. These sheep will do well in hills and rough terrain where other sheep do poorly. Our Association motto is: THE BREED THAT THRIVES WHERE OTHERS SURIVIVE. Adaptability: North Countrys have outstanding adaptability. They were bred to survive a cold, wet, hilly environment, yet our breeders are successfully raising them in warm, humid southern areas. They will feed on either poor or lush pastures. They enjoy rough terrain and are efficient browsers. Constitution: They are strong, hardy and long-lived. The ewes lamb easily. The lambs are born alert and active. Cross Breeding Ability: While an excellent sheep in itself, the North Country is also an ideal crossing sheep. When used with a fast maturing meat breed, the lambs produced yield a fine carcass with a high percentage of lean meat. The North Country can be used as either a sire or the dam. The rams are very active breeders. Prolificacy: Up to and over 100 percent lamb crops in poor conditions and up to 200 percent in good conditions can be expected. Well-grown ewe lambs can be bred without harm to their future performance. Temperament: The North Country is intelligent and spirited, but can be handled by 4-H and FFA youth successfully. Milk: The ewe is an excellent milker. She has a strong, protective mothering instinct. Carcass: The lambs have a high quality, fine-grained meat with a high proportion of lean meat. The lambs are slower to mature than meat breeds. At three to four months of age a first class North Country lamb could yield a carcass of around 45 pounds. Size: Live weight of an adult ewe in good condition is around 180 pounds. A mature ram will weigh around 300 pounds on good ground. Wool: Fleeces range from 4 to 10 pounds in weight depending on the condition of the animal. The wool is white, free from curl, hair and kemp. It has a spongy feel and good loft. The average staple length is 4-5 inches and the Bradford count is 50-56. This wool is used in the Scottish tweed trade. Good North Country wool is a favorite of handspinners. If you want a hardy sheep that can thrive whether the conditions are adverse or ideal, then North Country Cheviots are for you. 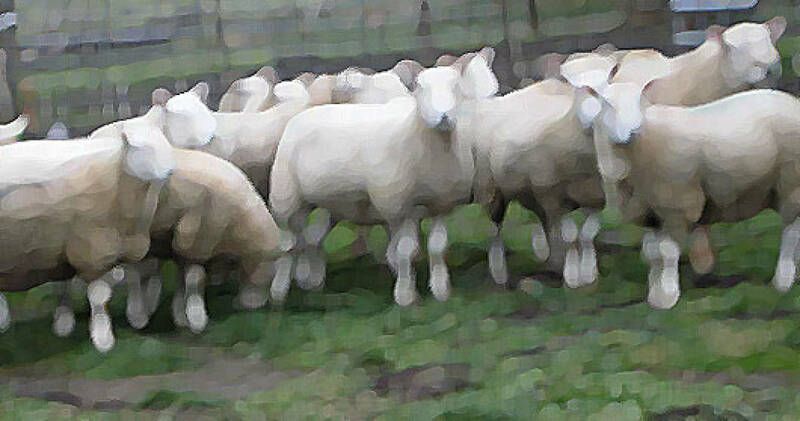 North Country Cheviot sheep are a “hill breed”. This designation encompasses much more than the fact that they evolved on the rugged Scotch highlands. Of necessity, hill sheep thrive untended by man, searching for browse on wild unimproved herbage. They usually lamb alone and the newborn lambs are able to survive by their near-miraculous ability to get up, nurse and run just minutes after birth. They are intelligent, self-reliant, resourceful and among the healthiest and most long lived breeds. Truly, they are the product of two hundred years of selection by survival of the fittest!